Traditional All Saints' Day pumpkins became almost a work of art in the hands of the American sculptor and fruits-and-vegetables carving master Ray Villafane. 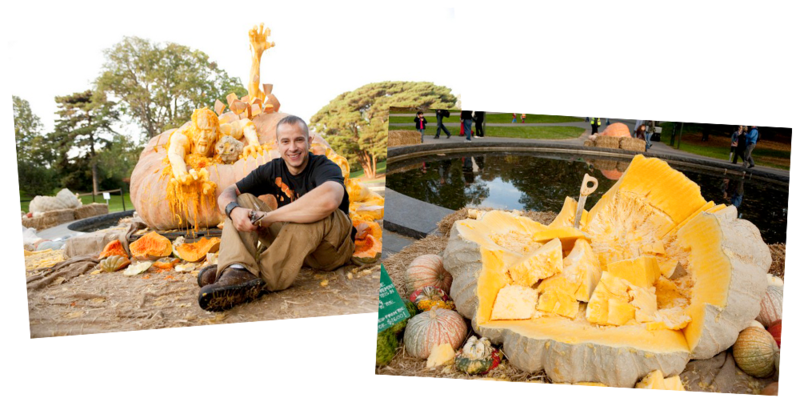 His skillful hands worked on two pumpkins: 761-kilo giant grown by Bordsen family, and 825-kilo pumpkin titanium by Jim Bryson. According to polls, 48% of world adult population believe in ghosts, 22% claim to have seen or felt a ghost, and 78% believe in life after death. Mysterious illusionist Harry Guddini (1874-1926), whether it is coincidence or not, died of appendicitis at Halloween night, and the same day in 1922 Mussolini became Prime Minister of Italy. Somehow scary, isn’t it? Those who believe Halloween to be newfangled and relatively young holiday, in fact, are wrong. Recently a theory is gaining popularity that the holiday originates from about 4000 BC, which means Halloween has been around for over 6000 years! Halloween is celebrated slightly similar by the Japanese. The canonical Halloween is not to be seen this day, but one can visit the Obon festival (other names are Matsuri or Urabon), It is also dedicated to spirits of ancestors and is sure to enchant you with the view of lanterns and candles floating on water. American city of Anoka (Minnesota), with population about 17 000 people, proclaimed itself to be the world capital of Halloween. It is the place where in 1920 the first big parade was held in honor of the holiday. Samhainophobia is obsessive fear of Halloween. 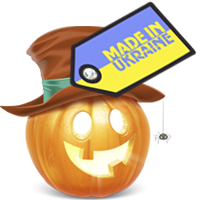 Well, we do not know about everywhere abroad, but in Kyiv we are not afraid of Halloween. This conclusion we did after visiting HALLOWEEN KIDS FASHION NIGHT SHOW - a bright show organized by JFSTAR magazine. Restaurant and Music Bar SEREBRO this evening turned into a medieval castle with ghosts. Werewolves, vampires, black magicians, sorcerers, drowned guys, mermaids, zombies and other creatures at nightfall gathered under gloomy vaults. Through the efforts of floral couturier LORA SHEN halls were decorated to create the atmosphere: grinning toothless mouths of Jack-o'-lanterns, bats curled over the towers, cobwebs hanging from the walls, dimly flickering candles. Mystical mood was stirred up by mixes that DJ TEAM IAN has stored specially for the occasion. Party hosts Andrew Romanidi and Tatiana Aliyeva demonstrated with all their image commitment to evil forces, resembling characters of Bulgakov’s Ball at Satan, and only Tatiana’s charming smile, time after time nullifying efforts of makeup artists, treacherously showed her good intentions. Make-up deserves a special note – it was something to see! While the guests were taking their seats, their children learned the basics of magic and witchcraft. To start with they mastered carving of Jack-o'-lantern under guidance of florists from LORA SHEN, then little ones also made candles and did magic tattooing with trainers of kids eco-club "Eureka". After incendiary performance by OPEN KIDS band, scene was farmed out to "forces of evil": fashion show by the Japanese kids brand MIKI HOUSE was performed by moms and kids who made the audience gasp on wonder at view of stunning costumes and make-up in horror style.